Minister of State for PHE, I&FC, Animal & Sheep Husbandry, Forest, Ecology and Environment, Mr Abdul Majid Padder visited far flung areas of Mahore and Arnas areas of Reasi district and convened public meetings, here today.The Minister patiently listened to the demands and problems of the people and assured mitigation of genuine problems on priority. He instructed the XEN PHE to address the problems related to water supply on priority and also instructed the engineers of PWD and PMGSY to complete the construction of taken up roads at the earliest. Minister added that the Government is committed to upgrade infrastructure, uplift the downtrodden and provide basic facilities and good governance to the people. 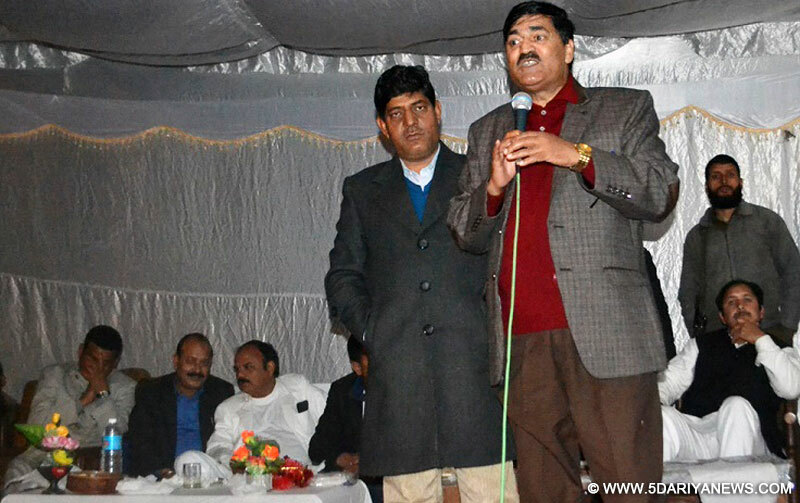 He highlighted various initiatives taken by the Government during last one year for the overall development of far flung areas.Earlier, People put forth their demands and problems for consideration of the Government related to supply of water, power, dilapidated condition of roads like Kanthan- Budhal road, Gulabgarh road, ration, opening of new dispensary at Mahore, water filtration plant, Forest huts, employment of local people in railway bridge construction at Arnas etc.DFO Reasi, senior officers of various departments, sarpanches, panches and people in large number were present.